Yesterday morning Abba, my consultation nurse, called me into his office to see a young woman. Abscess from a cavity in one of her teeth was his working diagnosis. My nurses know that these are serious cases and need to be seen right away, so he had appropriately had me come in to see her, instead of just adding her to the stack of carnets (health-care booklets) on my desk. That would mean I would see her, oh, around 5 or 6 pm. I agreed with his diagnosis, hard swelling around the neck, can’t open her mouth, in a lot of pain, been sick for a week. Yep pretty much a standard neck abscess from a cavity. It is truly amazing how much suffering can be caused from a very simple minor problem, not treated in a timely fashion. And as I have said before, it is not because Tchadiens are stupid, they are very smart. It is a matter of not knowing where to go to get help, and also not having the money to get there if you knew where help could be found. I went back to my office, which is just next door to Abba’s, our doors are probably all of 5 feet apart, sat down and began writing out the orders, including her Operating Room sheet (fiche operatoire). We started her immediately on fluids and all the big gun antibiotics I had, and started preparing her for surgery, I wanted to get the pus out of her neck before the swelling blocked off her airway. Three hours later we had her in the bloc (OR). She was given the usual ketamine/diazepam “anesthesia” that we use. We do cases like these 2 or 3, maybe even 4 or 5 times a month. Dental abscess, necrotizing fasciitis (flesh eating bacteria for the grocery store checkout magazine readers), fractured jaws, all these cases that prudent doctors uses general endotracheal anesthesia for. In other words, standard of care is to control the airway with a breathing tube. We control the airway by hoping the patient or family was truthful in telling us when they last ate, and by having a semi-functioning sucker handy if they seem to be vomiting or acting like they are aspirating. If things get really dicey we have an oxygen concentrator so we can give supplemental oxygen at 5 liters per minute. And we have the patient fully monitored, automatic blood pressure every 5 minutes, and continuous, mostly functioning pulse oximetry to monitor how well oxygenated the patient is. Then of course we stay observant to make sure the patient is breathing, although that can be lost sight of when we are busy trying to stop bleeding. I think you get the picture. There is not one time I have headed into one of these cases without being scared spitless, wondering if this will be “The One”, “The Disaster”, that will end up in a blog. There are more things that can wrong, lethally wrong, than you can count, and there is precious little I can do if they do go wrong. Things started out OK, Jeremie gave her enough meds to put her to sleep, her sats were good, she was breathing, we had prayer as we always do before each case, and then things started to fall apart. After prayer I opened her mouth and found pus, the abscess had obviously eroded into her mouth and drained there. We suctioned her out. I identified the most likely spot to open up her neck and found a pocket of pus. I put my finger in and broke into a much larger pocket, that covered most of her neck and under her chin. I could feel the mandible (jaw bone), the muscles, the salivary glands, but not a lot of pus came out, certainly not as much as I expected, and certainly not enough to remotely fill the cavity. She had obviously drained a lot of it into her mouth. About that time the beep from the sat monitor started to drop. Unfortunately to compound things she was one of the rare large (read fat) Tchadiens. So her neck was short and fat, and very swollen. I immediately did a chin lift/jaw thrust which was quite easy because her neck was open so I could just hook my finger around the chin part of her jaw bone. That usually does the trick, as most commonly the problem is just a bit of airway obstruction due to a relaxed tongue and jaw. And it worked, sats started to climb. All the way to 85%. It should have gone to 99%. By now we had her on oxygen, we got an oral airway in, and a nasal trumpet. She was breathing, moving her chest, moving air in and out. Then her sats started to drop again. Then they went back up, but not as high, then they dropped, and up. We gave steroids, kept up the jaw thrust, made sure the oxygen concentrator was actually working. She started to wake up and cough, so we sat her up, and tried to help her cough. Got the sat monitor working again. With her sitting up and coughing we got a good consistent reading of 99% for…not long. No as a matter of fact she wasn’t. We laid her back down. No pulse either. Started CPR, threw our whole ACLS pharmacy at her, adrenaline, made sure her airway was open, it was. Once she coded I tried to intubate her. The light was weak, the whole posterior pharynx was swollen and there was only one place the tube was going to go, into her esophagus. I had been watching for the last 15 minutes as we had tried to avert this. I had seen her oxygen saturation keep going up and down, but never going as high as it had been. Mostly around 50-70%. I had watched her pulse rise, 120, 140, 150. I knew that once she arrested it would be over. I figured she had to have aspirated, probably was all the pus that wasn’t in her abscess cavity. What else would make her be hypoxic with an open airway? We did the CPR anyway, my nurses were frantic, they found the bag valve mask and tried ventilating her. I learned that they had not a clue how to do chest compressions, and not a clue how to bag someone. That was probably the best thing that happened, because I have two western nurses and a western medical student, all who speak French who are going to do CPR and first aid training on Monday morning for our students and staff. I finally stopped them, her pupils were fixed and dilated, even if by some miracle we pulled her back she would at best be brain damaged if not brain dead. I tried my best to break the news to her mother gently. I thought she might have a clue that things had not gone well when I brought her into my office with another nurse. But it didn’t work, she was not prepared when I got to the part about, “she died”. We tried to be as caring and compassionate as possible, but what can you say? No one, not even in Africa expect that their loved one will die in the OR, on the table. They were fine when they went in, what do you mean they are dead? Diana took the family and the body home in the ambulance, it was the least we could do. And you are exactly right, those are the questions, the right questions. I have sat on quality assurance, peer review committees for years in the US. If a case like this came to that committee, I would lose privileges faster than the time it takes to read this sentence. If you really want the answers to those questions I invite you to come and work with us for a while, I think you will find the answers you are looking for. behind most of the rest of the world we can’t see the taillights anymore. It’s sad really, but I wasn’t surprised she died, I was surprised that in 24 months she was the first one. « Oooh-Ohh!! Ça fait mal, ça fait très mal !! » Sylvain screamed in pain as he lay on the soccer pitch holding his left leg. Sylvain is a normal 11 year old boy, in the third grade, the third of 6 children. His family is very poor, although he is lucky enough to still have both parents. They live in the village of Bembaida which is 117 km (70 miles) from Moundou. Sylvain’s family are farmers, and their little field only produces 2-3 sacs of grain a year. Now granted each sac weighs at least 100 kg (220 pounds), but for the whole year that is not a lot. As I noted, Sylvain is a normal boy, and like all little and big boys here in Tchad, he loves to play football (soccer). On this particular day last September he was playing with his friends. It is not clear what happened, but he fell to the ground screaming in pain. He had broken his left femur (the main bone between hip and knee). Now in every village you will find a traditional healer. A man or woman who has learned how to use natural products to heal the various maladies Tchadiens come down with. 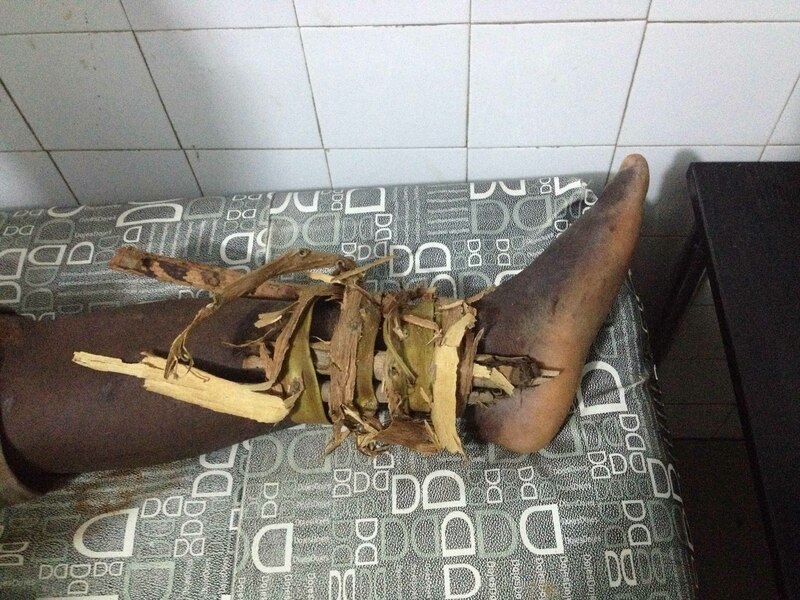 These traditional healers are also the local orthopedists. 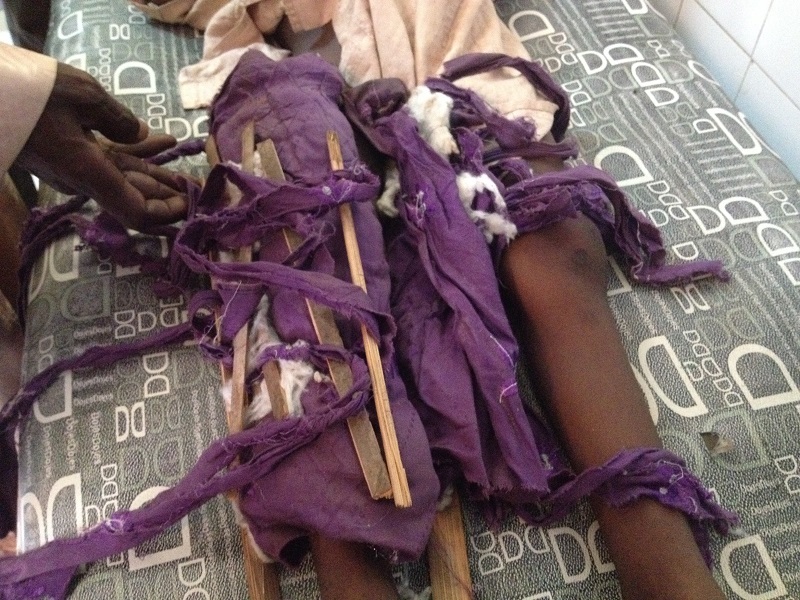 They set and splint broken bones, and often do a pretty good job, as long as there is no wound. 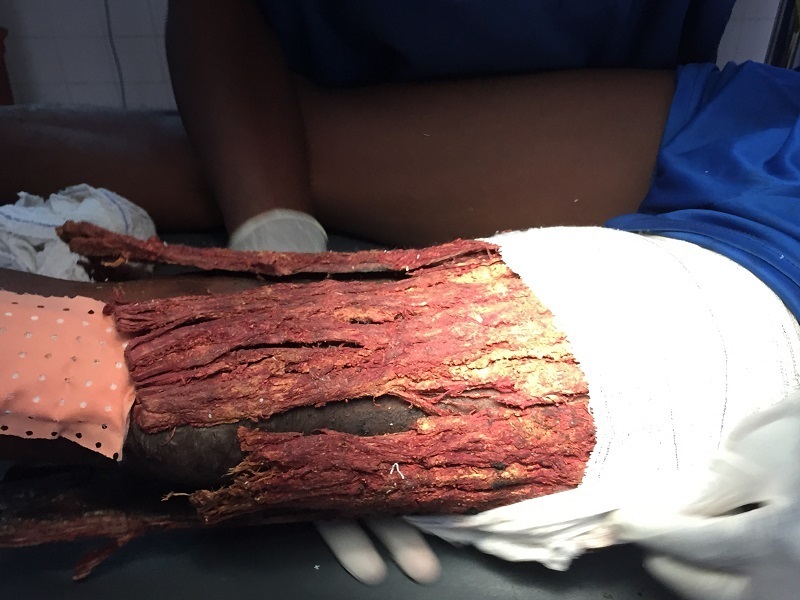 If it is an open fracture, the standard of care is to go to the local health center where the nurse will carefully and beautifully sew up the wound, making sure that all the grass, dirt, mud, and seeds are kept in the wound so they can’t get out of the wound and cause problems. Seriously, last week a lady came in with a nasty cut on the top of her foot. It had been sewn up at the regional hospital. The nurses had carefully cleansed the skin with betadine before closing the wound. We took her back to the OR and under spinal anesthesia opened up the wound. We found a bunch of what looked like hard little larvae. I asked her what was in the truck she had been riding on. It was full of millet, which is a grain. 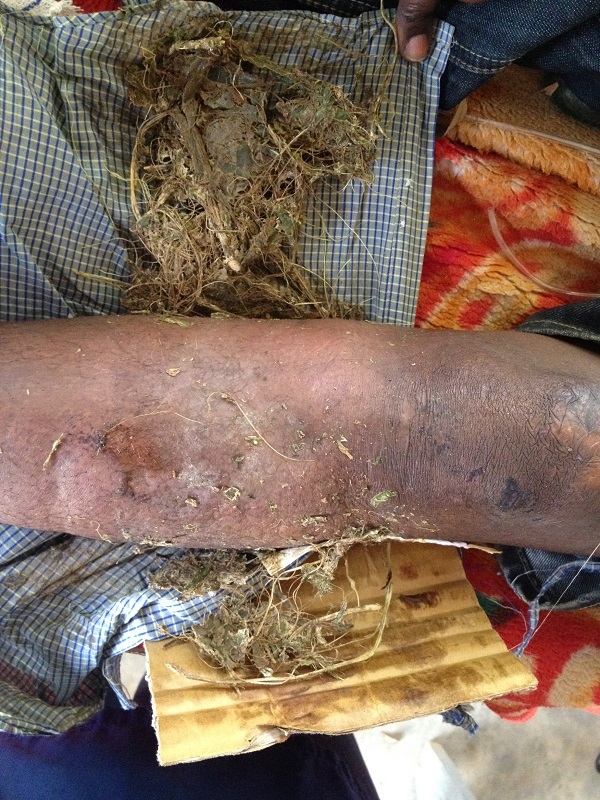 The Central Hospital staff had carefully closed her wound leaving enough millet seeds in her foot to grown a small garden. So back to Sylvain, his family called the local traditional healer who came four times and manipulated the fracture to get it set correctly, massage it, and do who knows what else. After the fourth attempt he admitted that this case was beyond his ability. Now that is a pretty impressive admission, as usually they just keep treating and accepting money until the patient gets better, dies, or the family fires them. When you don’t have string or rope, strips of bark and branches will do. Well the next step was to call the local “voyants traditionelles”. 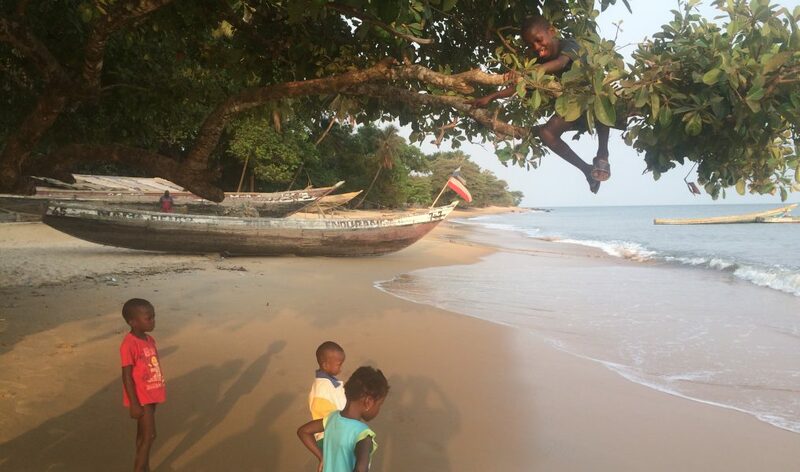 These are the “clairvoyants”, the witch doctors of the village. These individuals are also an important staple of each village. And everyone, Christian, Muslim, animist, all seek them out if all else fails. Well the local clairvoyants came and examined Sylvain. Their diagnosis was that one of the local sorcerers had trapped Sylvain’s soul and was holding it under a special Spirit Tree in the bush. Now these sorcerers, or evil clairvoyants are also a staple in the villages, and are used, again, by Christians, Muslims and animists (the traditional religion). If you have an enemy, or someone offends you, seek one out and they will, for a fee, cast a spell on the person, or somehow cause some evil to befall them. You may laugh, but it is real and it is true. And the spells work, people are killed or badly injured or fall terribly ill because of these spells. And it is not just a psychological thing. Bad things happen that shouldn’t when the cursed individual doesn’t even know he is cursed until after the fact. So Sylvain’s soul was trapped by a sorcerer under a spirit tree. Not a good diagnosis, but it obviously explained the reason the traditional healer failed. Immediately after that Sylvain’s leg began putrefy. It became more painful, swollen and started to smell as the muscle began to die. By now it was the end of October and Sylvain was dying. Fortunately for him, his parents were not about to give up, and they called the only person they thought could help, a friend in Moundou. On October 29 Jean-Paul went to the village and picked Sylvain up and brought him to our Center. He was, by this time, a very sick little boy. His hemoglobin was 3 (normal 12-15). He was given 4 units of blood and had his leg amputated, which by now was dead. Sylvain spent over 6 weeks with us as he healed. Despite the fact that he lost his leg above his knee, he kept his life. We were able to share with him and his family the story of Jesus. 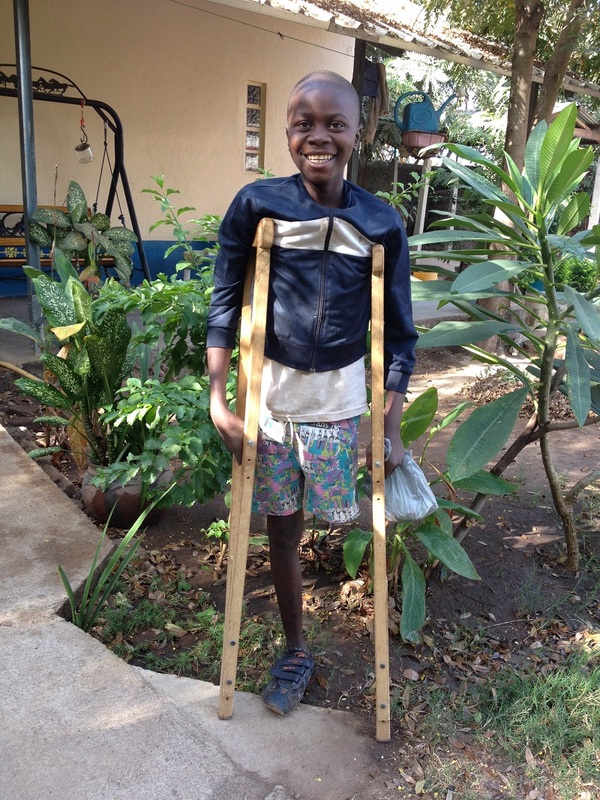 And Bekki was able to arrange with our local Handicap Center for Sylvain to receive a new artificial leg.